Vietnamese dishes use lots of mint and chilli to give them fabulous flavour. 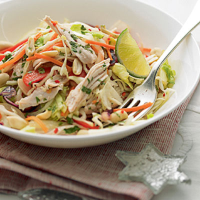 This salad is quick to prepare and a great way to use up turkey leftovers. Place the crunchy salad, cabbage, carrot and onion in a large serving bowl. Scatter over the shredded turkey. Place the chilli and mint in a small bowl. Add the sesame oil, fish sauce and the juice of 1 lime. Mix and season. Drizzle the dressing over the salad and vegetables and toss. Scatter the peanuts over and serve with the remaining lime cut into wedges, and crusty French bread. Leftover chicken works just as well as turkey in this salad. This dish will easily serve 4 as an accompaniment or starter.